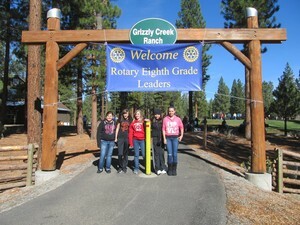 The Rotary Club of Winnemucca provided scholarships for five Winnemucca Junior High School students to attend a three day camp November 2-4, 2012 in Portola, California. One specific objective of the Rotary Eighth Grade Leadership experience is for the students to embrace the idea of creating a Caring Community at their school. During the three-day weekend at Grizzly Creek Ranch, the students developed and refined those skills and added tools to help in making choices, understanding themselves and being effective in a team situation. Our graduates are better equipped to be more effective communicators, to know themselves well and to make sound, ethical decisions in the coming years. These students are now catalysts for change in their school! Lucy Acevedo, Jessie Bell, Melanie Gomez, Jacy Urain and Annaleise Gabica.